Sydney Shop Girl: Happy Chinese New Year. Miracle Babies. May you and yours be blessed with prosperity, good health and good fortune this year. It's the year of the horse and apparently this will translate to a year of high energy. So look out for all kinds of excitement and high adventure this year. And not just on this year's season of My Kitchen Rules. I haven't quite gotten around to watching it but the twittersphere tells me that MKR is already embracing the theme of volatility the year of the horse brings. In the background, another of my pairs of Sambags. I've started the new year as I mean to continue - with a good cup of coffee in my hand and a comfortable pair of shoes on my feet. Top - $7 bargain from Target. Necklace - RPE. You also need a bit of gold today and here is mine courtesy of Red Phoenix Emporium. Calvin Klein Jeans - $39.95 at Costco. In keeping with tradition, I'm wearing an outfit that is both new and red. Say hello to my new skinny crop jeans from Calvin Klein Jeans via Costco. Any item of clothing promising power, stretch and skinny is obviously an item of clothing I have to own. In duplicate. This is the pair I own in a vibrant green. Toddler SSG is all set for today as well. He's got a new red polo and to go with his tropical print boardies from Cotton On Kids. It's a Chinese tradition that on the morning of New Year's Day, parents spend a quiet moment with their children to both give a red packet and bestow upon their child their hopes for the coming year. Toddler SSG was asleep as I left for work this morning but we had our little moment all the same and I tucked his red packet under his blankie. He's all American prepster this year because it appears that Cotton On have completely sold out of size one Rolling Stones Ts. Oh well, he'll be all set for watching the Super Bowl this weekend. The game is in New Jersey this year but I have heard that New York City has 'taken over' festivities. I'm planning to track down this year's half time ads on YouTube this weekend. The good thing about Chinese New Year being at the end of January is that I've had a month to 'practice' my new year's resolutions and work out how realistic they actually are. I'm happy to report that because I set pretty reachable fitness goals, I've managed to stay on track but at the same time still have some kind of challenge in what I do so I don't get bored. Which is why I've been touched and inspired by what my colleague Morgan and her two training partners have undertaken. The three mums are running the New York City Marathon in November this year to raise funds for the Miracle Babies Foundation. Miracle Babies is an Australian organization that helps premature and sick infants as well as their families as they navigate the rocky period of their hospital treatment (often in Neonatal Intensive Care Units) and then the nerve wracking transition of going home. In Australia, we are truly blessed to have such ready access to NICUs across the country and that the beds of these units are both state of the art and freely available to every baby in Australia should they need one. Miracle Babies adds to this service by looking after needs and concerns that arise for families outside the care their baby is receiving in hospital. 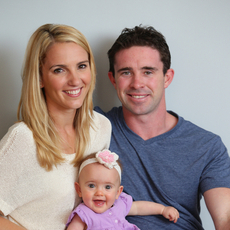 Morgan with her husband and baby Chloe. Morgan and her running mates have all been personally touched by Miracle Babies. Morgan is aiming to raise $10 000 by running the marathon. There are a number of fundraisers that have been organized but you can also donate directly to Morgan's fund via this link. I'm going to put a link up on the sidebar of the blog and leave it up until marathon day in November. I really hope Morgan reaches her target and maybe even exceed it. Happy Chinese New Year SSG!! Happy new year! :) Our traditional new years feast has been postponed to tomorrow, I've been staring longingly at all the yummy food photos on instagram today! And fingers crossed your friend raises her target for the marathon - great cause and fantastic goal! Happy Chinese New Year to you, too :) Those red jeans really caught my attention - power stretch sounds great! A HUGE Thank you to SSG for supporting us in raising $10,000 for the Miracle Babies Foundation! We are so grateful for everyone's support, it has been overwhelming! Thank you!